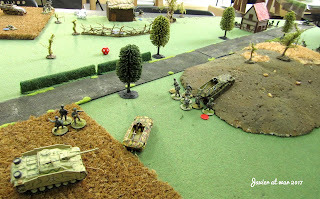 This is our second game with the rules Battlegroup Kursk and we are starting to love this system. It is easy, clear, fluid and fun to play. This game was a 400 points platoon level, meeting engagement scenario. Me with a platoon of armoured panzer grenadier with one sniper, one 80mm mortar, FAO, senior officer and one StugIII G platoon. The Russians with a platoon of infantry with two Zis, one Maxim, one sniper, NKVD, senior officer in a T-34 tank and an artillery spotter for a 120mm mortar battery. As you see, most terrain and miniatures are still WIP as we have just started with this project. 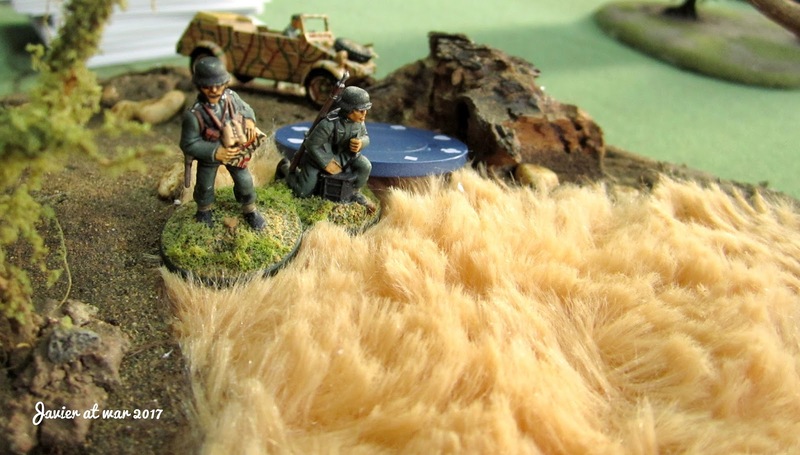 All terrain is from my game pal Alexis, the Russian opponent. End of turn 1; German forces have already grab their two closest objectives (Poker blue chits) and the Russian one of theirs. One of the Zis controlled the road so I avoided and moved on both flanks, already disembarking my senior officer and one squad of Panzergrenadiers. You can also see one of the Stugs ambushed in the field, waiting for the T-34. Later we knew the Zia were totally out of range. 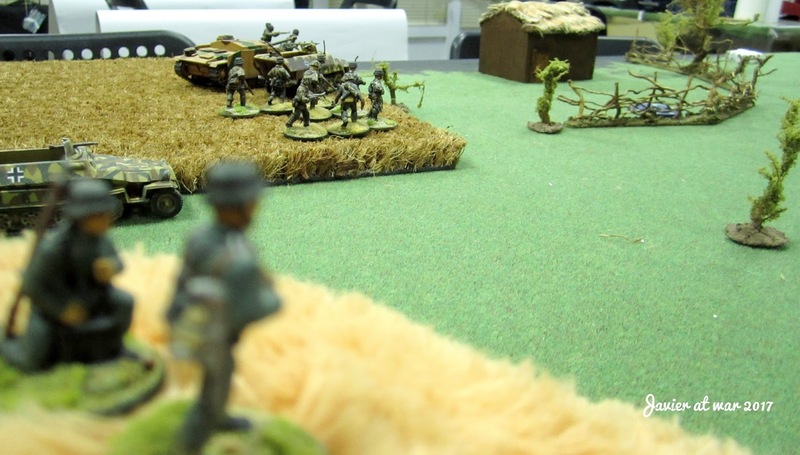 The Luftwaffe observer leaving the kubelwagen to grab one objective. The German miniatures are Valiant and they are quite more bigger than my opponent's, but I ordered a box of Plastic Soldier Company 1/72 German infantry to fix this! 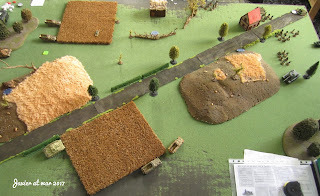 On the left flank I sent one Panzergrenadier squad with the platoon officer plus one StugIII, to fight for the third objective in dispute that you can see next to the fence. 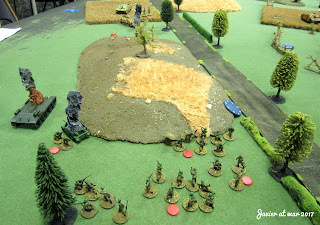 The soldier lying on the field is a Russian sniper who killed mine during the first turn of the game! A general perspective with some Russian infantry coming on my left flank and the T-34 and the artillery spotter on a Bren carrier on the other flank. 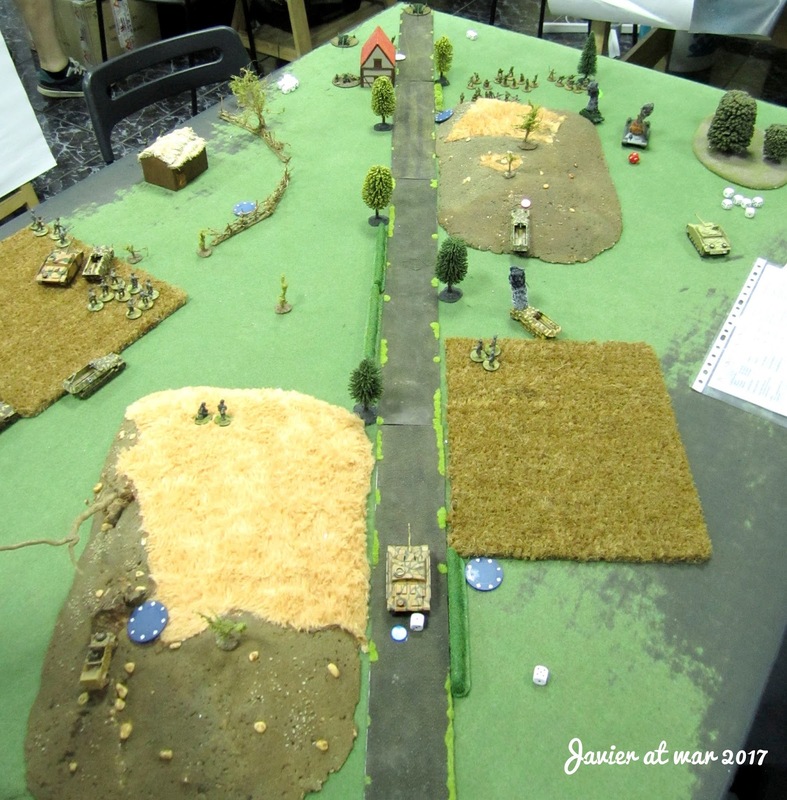 At the back and behind the hill, one squad pinned (red chit) by my 80mm mortar fire directed by the Panzergrenadier officer from his Hanomag. 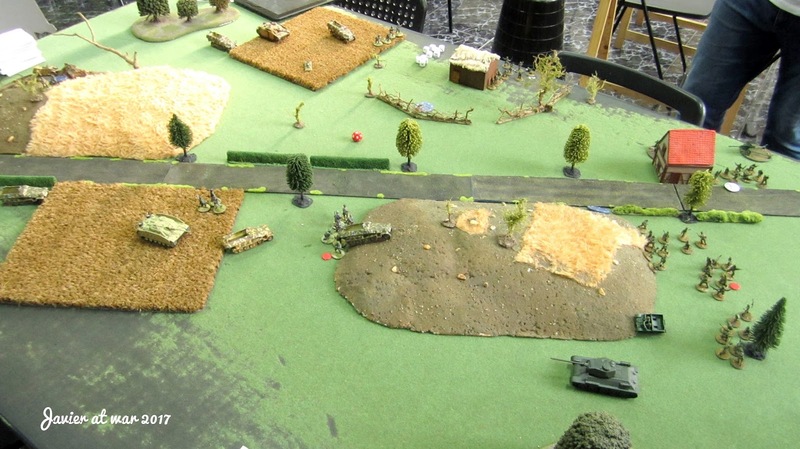 One turn later and things looking bad for the Russians as my Stug hunted down his senior officer on the T-34 and the Bren carrier stepped on a mine as well as most of the platoon pinned due to my mortar fire. 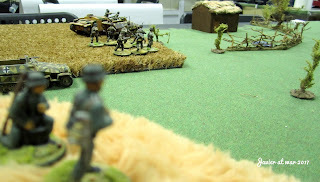 A view from my left flank where I had to send another squad to reinforce it, killing the Russian sniper in the process. Final shot with a general view of the game when the Russian reached their BR and withdraw. They could only destroy one Hanomag and one full Panzergrenadier squad with their 120mm mortar battery. 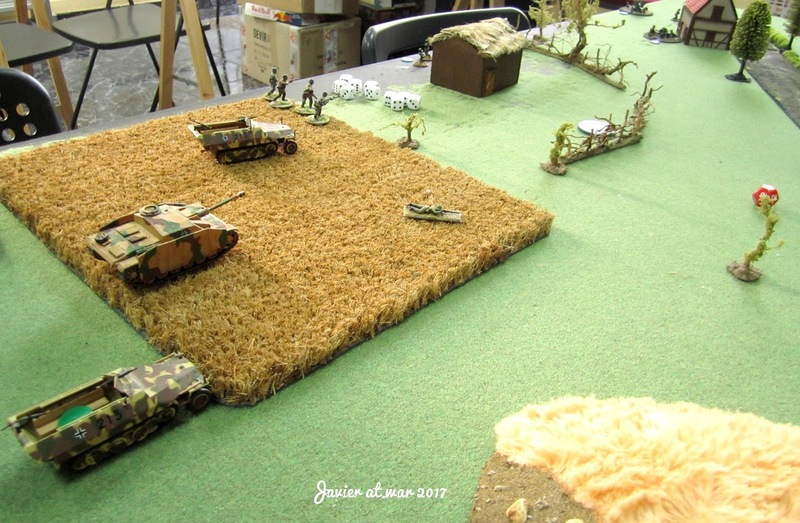 In our next game my opponent will be using more tanks so I hope it will be more interesting. See you in a week!